Scientific Edge / Sparking learning beyond school grounds! Sparking learning beyond school grounds! Summer vacations are over, and children who did not receive access to enriching learning opportunities are falling behind those children who did. These skills can’t be regained once they begin the school year and this effect is only repeated year after year -adding to the already existing educational disparities among individuals of different socioeconomic groups, which can be observed as early as 18 months of age. There are evident efforts to fix this and most of them focus on improving K-12 educational systems. However, kids only spend around 20% of their time inside their classrooms, so a broader range of solutions is required. A study was published last year regarding an intervention designed to support kid’s language skills. This intervention aimed at sparking parent-child interactions in places that families are naturally likely to visit, like the supermarket. They posted signs with a “question for your child” in grocery stores serving low and middle socioeconomic neighborhoods. This signs aimed to encourage dialogues between children and their caregivers, and they prompted more and higher quality talk between adults and children under the age of 8 years old. In front of the milk section for example, you might see, “I come from a cow. Can you find something else that comes from a cow?”. Researchers tested how these signs affected the interactions. The results? Both the amount and the quality of the conversations between adults and children increased significantly –by three times more! This study led to a much larger idea about creating opportunities for children in other settings. Urban Thinkscape, a pilot project, began their intervention by placing five different installations in public spaces. Animation streetlights, Puzzle Benches, Jumping Feet, Stories and Hidden Figures stimulated spatial skills and supported executive function skills. All these installations were created with specific learning goals in mind, reflecting the best practices in psychological research. Moreover, families had easy access to these learning opportunities; they didn’t need to travel far or pay to access these spaces and initiate interactions with their kids. This project tested factors like conversational turn-taking between parents and children, and the use of spatial and number words. Imagine the impact of creating captivating opportunities that keep caregivers and kids off their phones and that, instead, inspire countless conversations encouraging curiosity, building vocabulary, and exploring together. This idea brightened up a dull walk outside and brought playful experiences to families that otherwise may have not had the resources or knowledge to seek them out. This project wants to expand to other spaces like doctors’ waiting rooms and laundromats. This intervention reveals important lessons not only for kids, but also for educators, urban planners, and policymakers. 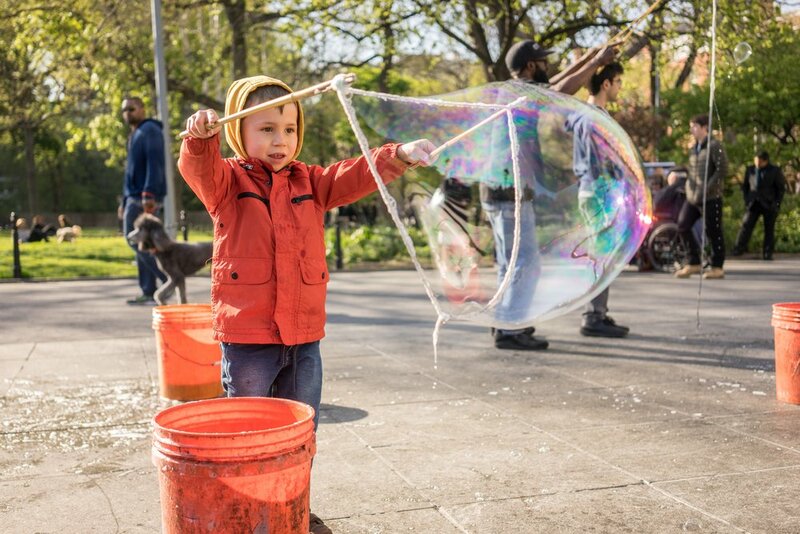 Activities in a real world urban context increase the visibility of enrichment opportunities that exist everywhere and are accessible to everyone and are critical to children growing, learning, gaining confidence, and becoming abstract thinkers. This innovative solution has the potential to advance academic and spatial skills in children, reducing the already existing gaps in school readiness and fostering better educational and life outcomes. In a much broader perspective, this development is essential to help build vibrant, healthy neighborhoods. Kinedu is a distinct sort of intervention, it aims to improve parenting skills and provide parents with activities and specific insights on their baby’s development to boost early learning. It creates exciting, creative brain-building moments in everyday activities that would otherwise not be taken advantage of. If we want to improve children’s opportunities for success, the most compelling influence for change is through behaviors, beliefs, and attitudes of the adults who interact and surround them everyday!